This study is part of a wider research program, which seeks to investigate the existence (or not) of relationships between sociomathematical and mathematical norms at different academic levels. Here, we consider the norms that arise in the interaction between primary student teachers when they solve a mathematical task related to the mathematical definition. We hypothesize that in the colloquial mathematical discourse between these students coexist two types of discourse as follows: sociomathematical and mathematical, each one with its specific norms. This coexistence can originate commognitive conflicts. We have been able to identify different commognitive conflicts that arose from the simultaneous existence of sociomathematical norms and mathematical norms linked to defining, approaching their generation. The research reported here was financially supported by the Ministry of Science and Innovation (Spain) through a grant corresponding to the project no. PSI2008-02289. 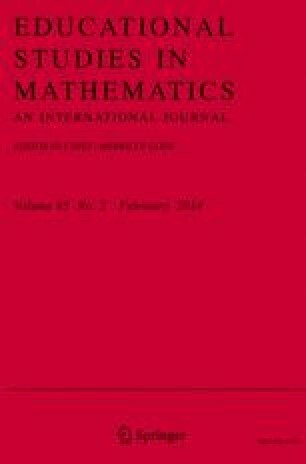 An earlier version of this paper was presented as a Research Report at the 35th International Conference on the Psychology of Mathematics Education (PME) in Ankara, Turkey, July 2011.